People nowadays, especially the younger generation show a lot of interest in cooking. There is so much exposure these days to learn to cook. Watching cook shows of favorite chefs, browsing for a recipe on the net, watching a cook show on online videos etc. all these have become very popular now a days. Its become an era of not just cooking, but cooking with the right cookware. Its become an era of throwing parties. New recipes are invented everyday. Baking has become popular. Table-scaping is given importance now a days. The use of the right kitchen appliance has gained importance. Its become a 'cook and dine with a style' era. The lifestyle of people have changed drastically over the years. To keep pace with the flow of increasing popularity of this kind of lifestyle, one needs to adapt to this change and look for avenues that educate them on the right choice when it comes to buying cookware/kitchenware/bakeware etc. It becomes easy for the buyer when all the brands are set before their eyes to compare and contrast the various choices that are available. I came across a leading portal Magickart.in that specializes only on kitchenware, bake-ware, cookware, dining, storage remedies, and kitchen appliances all under one roof. An ultimate site for everything 'cooking and dining'. All national and international brands are available. The search tool in their website is very powerful. Listing of items are very clear. The left column menu clearly lists the various brands available. Also, you can choose the price range. This gives the buyer a full satisfaction of selecting the right item among thousands of items, at the budgeted price. Shop online on Magic Kart for widest range of Kitchenware. Magickart.in is one of India's largest online shopping store for kitchenware and dining ware products. They have widest range in Kitchenware, Cookware, Bake-ware Cook pan, Induction stove, Pressure Cooker, Utensils, Pans and Pots, Casseroles & Kitchen Storage. There is a special Diwali offer that's running now. Don't miss it. COD (Cash on delivery) is now available. I would definitely recommend this site. Bookmark this site, a one stop shop for all things KITCHEN. Don't miss the exclusive offers this Diwali. Lots of gift ideas too. 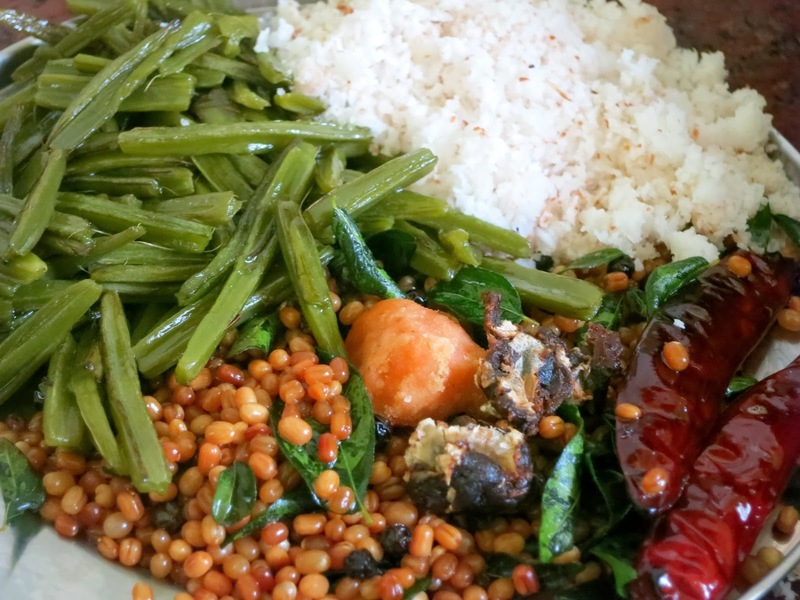 Pirandai chutney used to be one of the many dishes served whenever brahmins are invited for a feast. When I was very young, I din't know its medicinal value and pirandai chutney used to be the only item untouched in my leaf. Feasts in south India are normally served in plantain leaf. The leaf will be filled with traditional dishes, that are prepared with no onion, no garlic, no mushroom. Varieties of vegetable dry curries, salads, raithas, mixed rice, chutneys, and special sweets etc. will be served on the leaf. We colloquially call this 'elai saapaadu' or 'elai ootaa'. Total ignorance it was to ignore such a tasty and healthy chutney. Now that I know its value, and the more I long for it, it is not easily available in the city vegetable markets. In my native, my uncle used to bring a bunch of pirandai from the city outskirts where it grows in the wild and pirandai used to be tender and fresh. In my recent trip to native, I made sure that I bought the pirandai. Wanted to try the chuyney in my own kitchen and enjoy all the goodness the plant can offer. Handling pirandai is not easy. It makes the hands itchy and as a preventive method, gingily oil is applied to the hands before touching the pirandai. One way is to hold the pirandai using a paper and trim the sharp ribs and also fiber is removed. 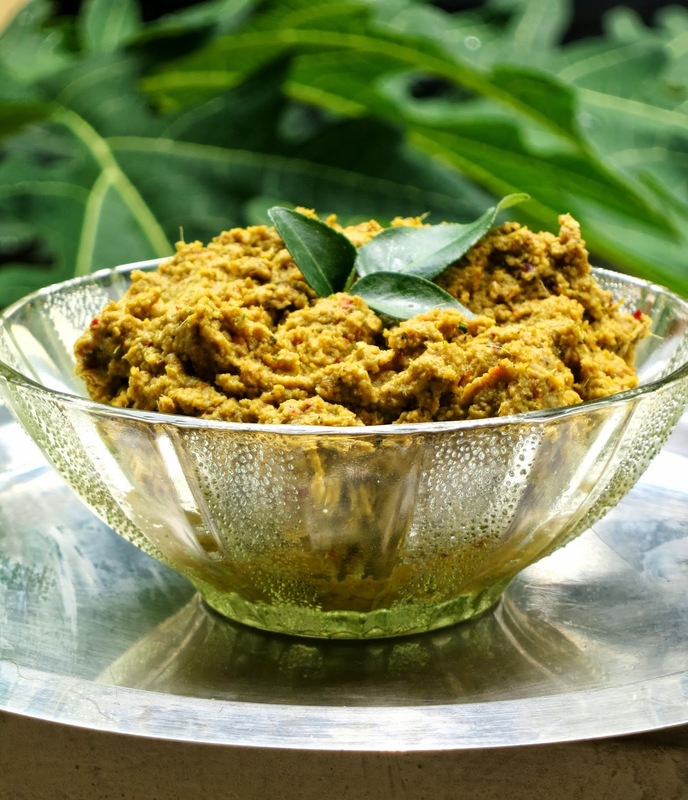 Tender pirandai is used for chutney as fiber is much less and smooth texture of chutney is possible. Using little tamarind in this recipe is highly recommended as it neutralises the itching tendency of this stem. Before I go to the recipe, let me not forget to tell you the healing power of this stemmed vine. Cissus quadrangularis or Pirandai as it is called in tamil, is a plant/creeper/herb from the grape family. Its a magic medicine for people suffering from degenerative bone and joint pain. Pirandai is used widely in the country side. 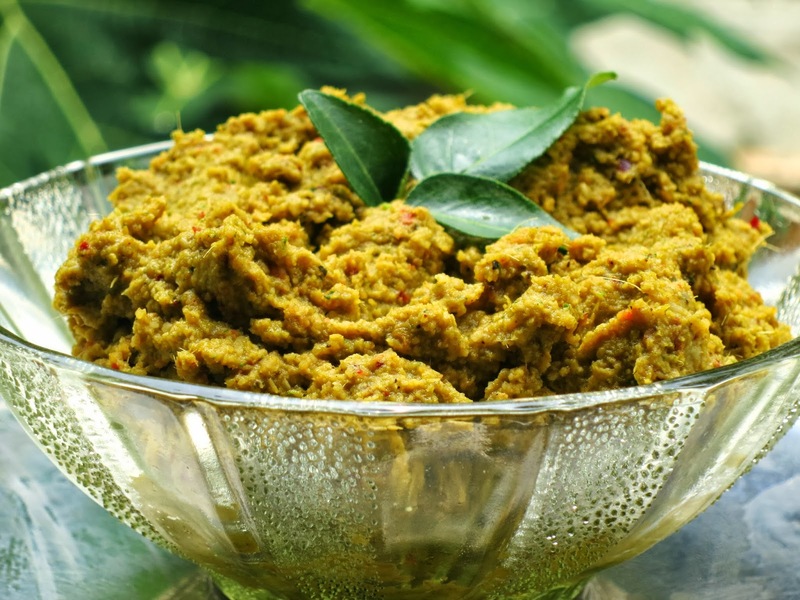 Using the tender stemmed vine, this traditional dish called Pirandai Chutney or Pirandai Thogayal is prepared. This vine, which heals fractured bones faster, is loaded with vitamin C and Calcium. The benefits of pirandai also includes healing digestive problems, breathing problems, cough, nausea etc. It also acts as an appetizer. This chutney tastes almost like heerekai/peerkangai/ridge gourd chutney. Wash the pirandai. Apply gingely oil in your hands and carefully remove/trim the sharp ridge. chop it to one inch and remove the fiber if its present. Keep it aside. rub your hand with salt if there is an itching sensation. Heat a table spoon of oil in a kadai and roast the urud dal until golden. Reduce the heat and add curry leaves, peppercorns and red chillies. Fry for a minute and turn off heat. Transfer it to a plate to cool. In the same kadai, heat a table spoon gingely oil and fry the chopped pirandai. You will notice that the pirandai shrinks and color changes to pale green. Turn off heat and keep it aside to cool. When the above preperations have reached room temperature, combine the roasted ingredients, pirandai, jaggery, tamarind, asafoetida powder, grated fresh coconut and salt and grind it in a mixie using minimal water. Grind it to a coarse paste (like in the picture) or add little more water to make it to a smooth chutney. Mix a spoon of this chutney and a dab of ghee to steaming white rice and serve immediately. This chutney does not need seasoning. This is a great accompaniment for iddli, dosa or as your taste permits, even chapathis too.